Lorentzian wormhole, courtesy of wikipedia, with text I added to the image. 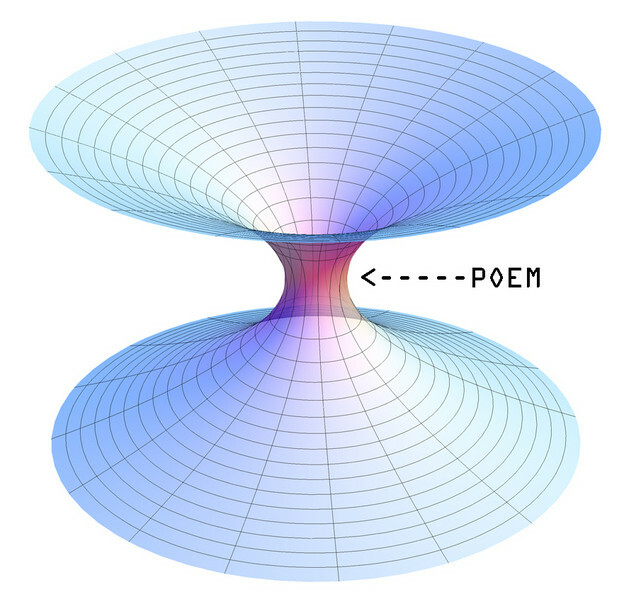 If a poem could exist on a rocket ship traveling at the speed of light where, in Albert Einstein’s theory of relativity, space compresses, mass increases, and time slows, what kind of poem might it be? According to Einstein’s theory of general relativity, which applies at cosmological scales in contrast to his earlier theory of special relativity that applies at local scales such as the solar system, profound distortions of spacetime would have to occur in a universe where the speed of light is constant. In M. NourbeSe Philip’s Zong! (Wesleyan University Press, 2008), created from the legal decision about the African slave ship named Zong where some 150 slaves were murdered by drowning so that the ship’s owners could collect the insurance money, the arrangements of text units in many sections of the book-length poem seem to inhabit aspects of Einstein’s conceptions of the universe. The blank space in the poem—like the space in Einstein’s rocket ship traveling at the speed of light—appears to compress (what’s known as time dilation in relativity) in relation to the text units. The broken words and ghostly erasures in some sections, speaking to Philip’s notes about “telling the story that cannot be told,” creates the impression of time slowing amid the compression of space, hauntingly enacting the experience of drowning. And mass, what is thought of as matter in physics and what could be conceived of as the material language or thematic content in poetry, seems to increase through the physical elongation of text units in the poem, where words and phrases are sometimes broken and stretched.Unlike in relativity, however, the speed of light in Zong! is not constant. Further, unlike visually normative poems situated in a Newtonian universe where the passage of time is uniform, Zong! is traveling through a universe where spacetime can contract and expand. In this ’pataphysical reading of Zong! using quantum poetics as a speculative mode of interpretation, the book is not only inhabiting aspects of general relativity at astronomical scales, it is also inhabiting aspects of special relativity at local scales, for Philip recently mentioned that one of the formal constraints she used is that she never placed text units directly below other text units so that there would always be space above each text unit, symbolizing the way that poetry can represent a moving toward. Photo I took of pages 90 and 91 from M. NourbeSe Philip's Zong!. If a reader thinks of a page of poetry as a two-dimensional representation of the universe, in Zong!, as in relativity, space is not empty, and matter does not inertly move through space; matter tells spacetime how to warp the spacetime in its vicinity, and warped spacetime tells matter how to behave. To my mind, there are numerous flaws in Einstein’s theories of relativity that I will address in upcoming commentaries, but I still find many aspects of the theories—such as the way matter and spacetime interact as well as how wormholes are conceived in the theories—useful for developing thought experiments in poetics. As noted in the book, Physics of the Impossible (Anchor Books, 2008), by physicist Michio Kaku, a founder of contemporary string field theory, Einstein introduced the concept of the wormhole in 1935. In Einstein’s universe, Kaku explains, the shortest distance between two points is not a straight line; if we curled a sheet of paper until two points touched, then the shortest distance between two points is a wormhole. Photo I took of M. NourbeSe Philip's Zong! where I curl page 90 until two points touch to illustrate Einstein's concept of a wormhole. By visually, sonically, and conceptually enacting its subject matter, Zong!, like a curled piece of paper representing the concept of a wormhole in Einstein’s universe, might function as a wormhole between the Zong massacre in 1781 and the contemporary reader, inviting, among many other responses, more nuanced and complex forms of remembrance, empathy, compassion and dialogues about racism and the ongoing impacts of the transatlantic slave trade. Is this a wormhole in physical or figurative space? That may depend on the poetics—and the physics—of the reader.